Despite being a city girl at heart, as the snow melts and the mercury rises, an overwhelming desire to get out of town and into nature comes over me. 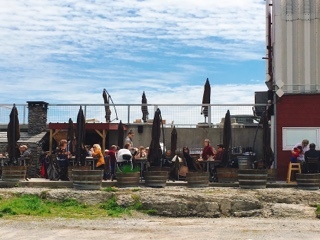 In Toronto, we’re blessed to be within a 2-hour drive of two wine regions: Niagara-on-the-lake is the better known of the two, but Prince Edward County is becoming increasingly developed and offers a fair collection of wineries, without the crowds. After all, while lounging in nature, the last thing I want to do is battle a throng of tourists. During sunny days, being outside in a vineyard is serene – basking in the sun and taking in the greenery and rows of vines. At Norman Hardie, you can do this in comfort while enjoying a glass of wine and a hot wood-burning oven pizza. Ah… relaxing perfection. 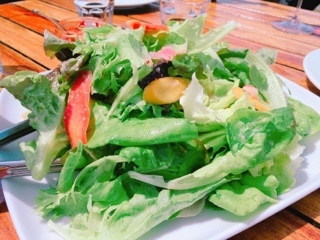 Before tackling their pizzas, our foursome shared a large portion of their organic greens ($15), tender lettuce leaves with crunchy heirloom carrots dressed in a light tangy oven roasted shallot dressing. It feels like you’re doing something healthy and dampens any hunger pains as we wait for the mains to arrive – given the pizzas are made-to-order by one person in one oven, it can take a while. 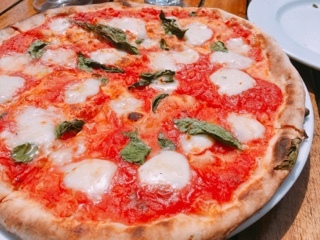 Ordering a margherita ($14) pizza is a great way to gauge a restaurant’s quality. It’s just tomato, cheese (in this case fior de latte) and basil – no overly strong flavours to detract from the tried and true ingredients. The crust made me swoon: despite being paper thin the bottom was crispy and allowed slices to be held without becoming a droopy soggy mess. Yet, the dough still has a soft chewiness to it and didn’t become a crispy cracker. If you’d prefer a meat version of the margherita, try the di taleggio ($17), which has the same base but also incorporates salty cured speck and mild taleggio cheese. 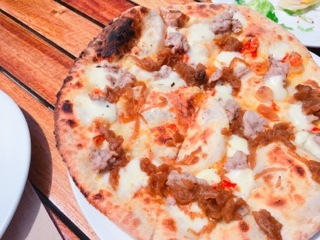 Yet it’s the salsiccia ($17) white pizza I yearn for with its plump pieces of crumbled sausage, sweet caramelized onions, spicy hot peppers, garlic, and fior di latte. The pizza is satisfyingly rich and flavourful; it went particularly well with the glass of County Gamay ($12). 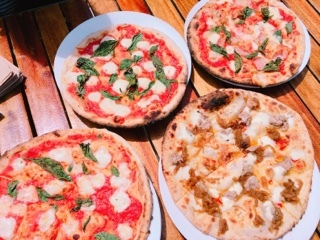 Do yourself a favour and set aside at least an hour and a half for the meal – you may need to wait for a table and the freshly made pizzas take time. But most importantly, enjoy the time just being outdoors amongst the vineyard, sipping wine and tucking into a hot pie. Road trip anyone?